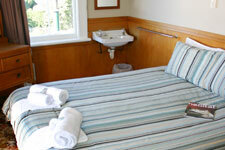 Accommodation options at The Pier Hotel, Kaikoura, New Zealand. The 10 bedrooms upstairs in the hotel are configured into single twins, triples (one King, two single beds) and king-bed rooms (share bathroom facilities in keeping with the 130-year-old era of the hotel). The majority of the rooms have access onto the sunny wrap-around balcony, where many a breakfast and evening cocktail have been enjoyed to the smell of the sea and sun and ocean views. Sunrise and sunsets are in a word—awesome! The share bathrooms are private and modern once in use. We are pleased to be able to offer full Bed and Continental Breakfast at a very affordable rate: breakfast is included in the room price. All the rooms have new beds, pillows and linen. Dinner can be provided if you arrive on Friday night, but only when this is booked in advance. If you arrive on a Friday, would you like to have your dinner here? Please contact us to secure your booking!